What are urban floods and why are we witnessing them? Urbanisation affects disasters just as profoundly as disasters can affect urbanisation,” writes Mark Pelling, geographer and climate change expert at King’s College, London, in his book, The Vulnerability of Cities. In recent times, urban flooding has emerged as a major concern. 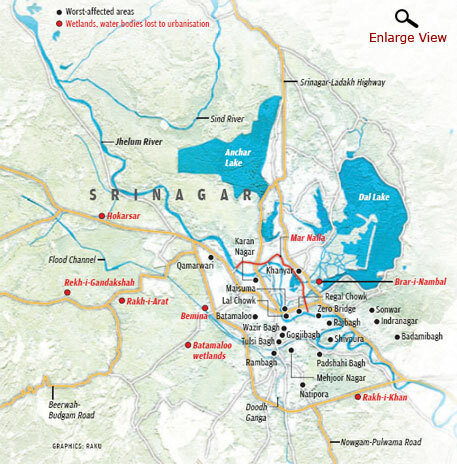 As the weather gets more erratic and one-time rainfall, like the one recently witnessed in Srinagar, increases, large concentrated populations in urban areas face increased risk of flood. There are some peculiarities of flooding in urban areas. Its primary reason is surface water runoff. Surface runoff is the excess water from rain or melting snow that flows over the earth’s surface without getting absorbed. In the urban landscape, it is controlled and managed artificially through drains which flush out the runoff from the city, unlike in rural settings where the runoff is absorbed naturally by farmlands and ponds. Urban areas are characterised by impervious surfaces like roads, pavements and buildings. High rate of development and construction in these areas has resulted in the loss of soft landscape. This decreases a city’s capacity to absorb water, making it dependent solely on the outflow of surface water runoff. Under such circumstances, even moderate rainfall can lead to flash floods in low-lying areas. Cities located along a river might face an added problem if the river flows at a higher level within its embankment. Guwahati, a low-lying city on the bank of the Brahmaputra river, faced unprecedented flooding this year. In the past few years, flooding in Delhi due to overflow of the city’s 18 major drains has become a common phenomenon. Heavy rain in the Yamuna’s upstream increases its water level in Delhi, due to which the drains in the city experience reverse flow. As more and more farmlands and green areas are being urbanised, the amount of surface area for water percolation is getting reduced. As a result, all the runoff flows on the land, without being absorbed. This increases the chance of floods. Another reason for urban flooding is the lack of drainage system in an urban area. As there is little open soil to absorb water, nearly all the excess rainwater needs to be transported to the drainage system. High-intensity rainfall can cause floods when a city’s drainage network does not have the capacity to drain away excess water in adequate time. A 2003 study by C P Konard, published in the US Geological Survey, shows that the streams in the urban areas of the US rise more quickly than those in rural areas during storms and have higher discharge. Thus, urban spaces flood more rapidly. It also shows that debris from broken bridges and other construction that the streams collect further restrict the water’s flow from the city, increasing its level and causing floods. 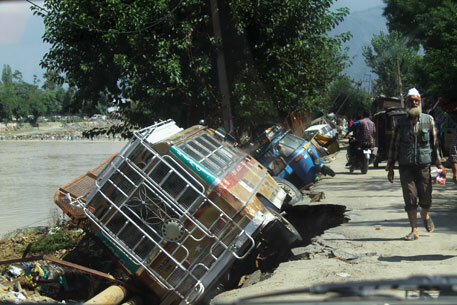 The risk of infrastructural damage increases with increasing urbanisation. A 2013 research paper by U S De, former additional director-general of meteorology (research), Pune, analysed flooding in four megacities of the country—Delhi, Chennai, Kolkata and Mumbai. The paper demonstrated how rapid and uncontrolled urbanisation is at the root of floods and flood-related damages in these cities. It noted that the mechanism for urban flooding is complex and location-specific. Hence, each city needs its own flood management practices. Encroachment is another fallout of urbanisation. The paper mentions that the number of water bodies in Delhi has been reduced to 600 from the original 800 due to encroachment. It notes that the floodplains of the Yamuna—home to thousands of illegal colonies—are the most populated parts of Delhi. High population density demands more infrastructure, leading to environmental degradation. By 2025, the population of tropical Asia is estimated to rise to 2.4 billion. Many of the most populated cities of the world—Tokyo, Mumbai, Shanghai, Kolkata, Jakarta, Delhi, Seoul, Manila and Dhaka—are located in Asia, three of which are in India. Kolkata has been built on wetlands. Chennai, too, has seen massive construction in recent decades, reducing soil cover and vegetation. While other cities can expand in adjoining areas, Mumbai cannot due to its long coastline. The city was built by merging seven islands and hilly areas. 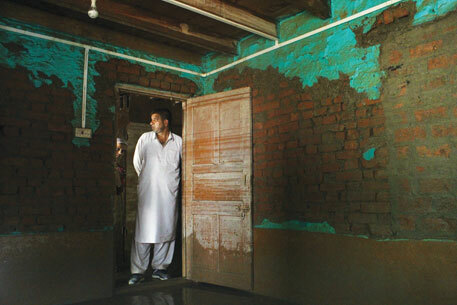 Nearly 60 per cent of Mumbai’s population lives in poorly built temporary settlements. Only three outfalls (discharge point of a waste stream into a body of water) to the sea have floodgates. The remaining 102 outfalls in the city open directly into the sea. During high tide, the sea water enters the drainage system through these outfalls, causing floods. The year 2005 was recorded as the hottest year of the century. Incidentally, in the same year, the worst urban flooding was reported in Mumbai on July 26-27. During those two days, the city witnessed an unprecedented 944 mm of rainfall in 24 hours. In the same year, 10 severe urban floods were reported from across the country. 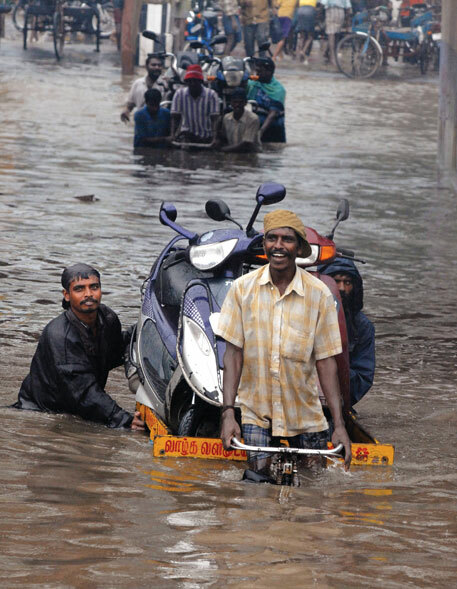 Three-fourths of Chennai was inundated. It affected more than 500,000 people. 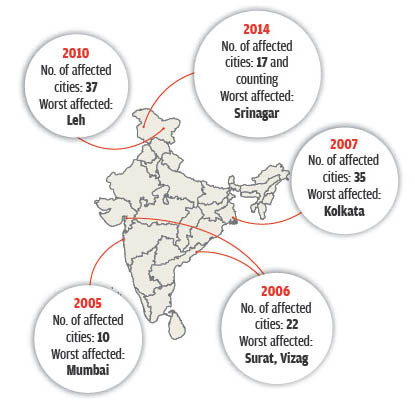 In 2006, 22 cities in India reported floods. The increasing trend of urban flooding was carried into 2007, where the number of affected cities rose to 35. Extreme weather events have increased in recent times. “Floods and droughts will become more frequent. One projection shows that the intensity and the number of tropical cyclones will increase in the next 40-100 years,” De says. Anil K Gupta, director of the Wadia Institute of Himalayan Geology in Dehradun, Uttarakhand, adds that the entire Himalayan range is vulnerable because of rising temperatures. “Each and every valley—be it Kashmir, Kedarnath or Badrinath—faces the threat of increased precipitation,” he says. According to the Jammu and Kashmir State Action Plan on Climate Change, 2013, minimum temperatures in the Himalayan region are projected to rise by 1°C-4.5°C. The report also says that the number of rainy days in the region in 2030s may increase by five or 10. The intensity of rainfall is likely to increase by 1-2 mm per day. 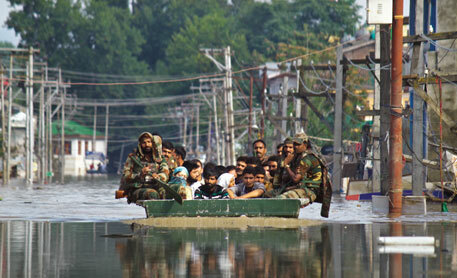 “What is increasing is sudden precipitation, which happened during the recent Kashmir floods,” Gupta says. A report by the UN Intergovernmental Panel on Climate Change notes that every year there will be at least one extreme weather event in the Himalayas. 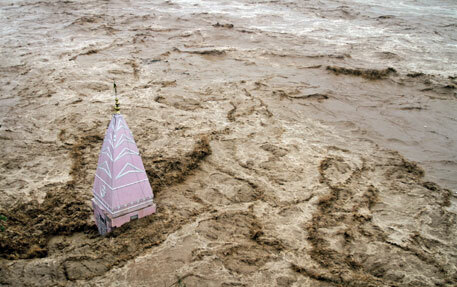 “Last year, it was the Uttarakhand disaster. Before that we saw floods in Pakistan and cloudbursts in Jammu and Kashmir,” says Jatin Singh, chief executive officer of Skymet, a private weather forecast company. In the course of such events, many urban areas are likely to be affected, the way Srinagar was caught unawares. The India Meteorological Department (IMD) is yet to recognise that extreme weather events are a result of climate change. For the last four major natural disasters in India—Mumbai floods of 2005, Leh cloudburst of 2010, Uttarakhand disaster of 2013 and J&K floods of 2014—IMD has cited disturbances in the wind current and monsoon as reasons. It used words like “unprecedented”, “unusual” and “unique”, but offered no explanation for why these events are happening at such high frequency. In light of the complexity of urban floods, we need a comprehensive plan of action to reduce the damage thus caused. How do we manage urban floods? Is there a protocol? Despite warnings from the Indian Meteorological Department and the state Irrigation and Flood Control Department, Jammu and Kashmir went under water because it did not have a contingency plan, nor did it have a well-equipped state emergency operation centre (SEOC). One might argue that when Mumbai was hit by flood in 2005, Surat in 2006 and Kolkata in 2007, each city had functional SEOCs, yet they failed to prevent the disaster. This is because the floods they faced in those particular years were quite different from the floods they had faced earlier. Urban floods are a new challenge. Census 2011 showed that for the first time since 1921, the urban population in India was much more than the rural population. A 2008 study by the National Institute of Disaster Management showed that the annual economic losses from urban flooding are much higher than those incurred from other disasters. The National Disaster Management Authority (NDMA) decided to deal with urban flooding separately. In 2008, it formed a committee on urban floods which formulated the National Guidelines for Management of Urban Flooding. The guidelines were released in 2010. NDMA acknowledges the increasing frequency of urban flooding. It says that the causes of urban flooding are different for each city, which is why flood management strategies need to be customised. Policies for a coastal city, for example, would have to be different from a city located on the hills. The BrihanmumbaiStormwater Drainage Project is being redesigned. 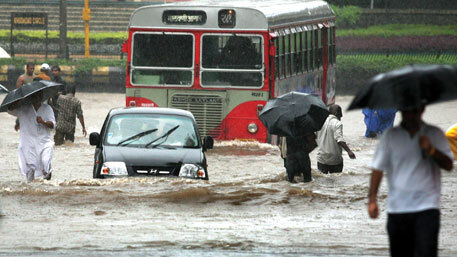 A rapid flood risk assessment for the city is being carried out by the Indian Institute of Technology, Bombay. Under the Jawaharlal Nehru National Urban Renewal Mission, drainage rehabilitation, construction of roadside drains, flood protection measures and desilting of the Tapiriver are being taken up by the Gujarat government. An early warning system for urban flood management is being developed by the Centre for Remote Sensing, Anna University, and the Tamil Nadu government. A pilot project on Urban Flood Impact Assessment for Hyderabad is being taken up by the government of Andhra Pradesh in association with the National Disaster Management Authority and Greater Hyderabad Municipal Corporation. NDMA proposed an Urban Flooding Cell with a technical umbrella for forecasting and warning at the state level. It mooted a local network of automatic rainfall gauges for real-time monitoring. Local authorities were asked to go in for contour mapping, put the existing storm water drainage network on geographic information system (GIS) and desilt all drains by March end every year. It also suggested that lakes should be freed from encroachment so that the natural drainage system of a city could be maintained. Most of the state governments have not been sincere in implementing NDMA’s guidelines. “But are the guidelines binding?” asks A K Sarma of the Indian Institute of Technology (IIT), Guwahati, who was a member of the committee formed by NDMA. It is up to the states to implement the rules. The state governments are not “compelled” to follow the guidelines, so nothing ever happens, Sarma adds. He says there needs to be a holistic approach to address urban floods. “While preparing the guidelines, we had the diversity of India in mind and knew that the rainfall that Jaipur receives is not the same as what Shillong receives. So we tried to cater to all types of cities,” he explains. He adds that for proper implementation of the guidelines, various departments have to come together. For example, the problem of urbanisation is not only wrong town planning but also encroachment of wetlands and water channels, which reduces a city’s natural capacity to handle floods. To correct this, municipal corporations have to work closely with the Irrigation and Flood Control Departments. But administrative differences make it difficult to handle a disaster like urban flood. This is evident from what happened in Srinagar. Despite repeated warnings by the Irrigation and Flood Control Department about the encroachment of the drainage channels in the city, the Srinagar Municipal Corporation failed to clear these channels. NDMA guidelines also stress on the need to make the planning process participatory. Following the hierarchical structure of administrative systems, flood control measures are planned without the participation of the affected communities. “In many cases, this results in unsustainable measures which don’t meet the needs of relevant stakeholders,” state the guidelines. While most cities in India are yet to wake up to the problem of urban flooding, Guwahati, which faces floods almost every year, is getting ready with an action plan. The Guwahati Metropolitan Development Authority (GMDA) has taken up a project in the city’s Garbhanga hill for scientific management of rainwater that flows down the hill during monsoon, triggering landslides and choking drains with silt. Siltation in the drains by sediments carried by rainwater has been identified as one of the major causes of waterlogging in the city. GMDA also plans to clear encroachments along the drainage channels of Guwahati. GMDA is being given technical support by IIT-Guwahati, and Shristie, a city-based civil engineering firm, which focuses on plantation in the hills, development of an efficient drainage system, putting up structures on the hill to check the speed of water and rainwater harvesting. The project is touted to be the first of its kind in India. While some states have accepted that urban floods are becoming frequent, as are extreme weather events, and are taking steps to revive their natural drainage systems, others continue to be in denial. It is time the governments woke up to the crisis of urban floods and took adequate measures to preserve the ecological balance, while keeping contingency plans ready to deal with any unforeseen disaster. TORONTO AND Region Conservation Flood Management Programme of Canada is considered a model for flood management in urban spaces. In practice since 2011, the programme forms a close link between Canada's Weather Office, Ministry of Natural Resources and local government agencies of the four sub-divisions of Toronto-Durham, Peel, Toronto and York. One of the major tasks undertaken is clear and consistent flood warning. Localised warnings help the authorities to convince people to move to secured locations. One major problem that the authorities in Kashmir faced was the inability to convince people of the seriousness of the situation and the need to move to safer places. The three departments also identify flood-prone areas and undertake mitigation measures to reduce risk. In terms of infrastructure, the Toronto and Region Conservation Authority is mandated to operate and maintain flood control infrastructure across all regions of Toronto, including large dams, channels, flood walls and dykes. Arizona, a south-western state of the United States, has gone a step ahead to retain the water quality after floods. The Flood Control District is a plan to control flooding in Maricopa County, the worst-affected region of Arizona. The plan is being carried out as per the National Pollutant Discharge Elimination System Stormwater Programme as part of the Clean Water Act. A guide and awareness manual has been circulated among the public and local authorities on ways to prevent floodwater from entering into the water channels of the area. The following shows the fact -- "Abdullah defended himself by saying that state capitals had never been hit by a disaster in recent memory. 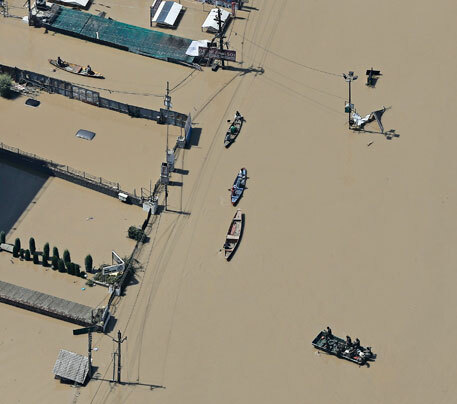 But the devastating flood could have been averted had his administration and the Union government taken necessary steps to save the drainage channels of Srinagar when an alert was sounded in 2010.". Most of the urban areas are located along the water bodies. With population growth with bad governance -- real estate business zooming -- most of the water bodies either encroached or filled with rubles or drainage, there is no way for rain water to go. The only place entering in to houses. It has become a fashion to say it was a unusual rains. But no body cares to look in to the data -- rainfall and river floods. In 2000 Sept. low lying areas were flooded with rainwater. Some parts, the water reached 2nd floor. The governments must open their eyes plan for future -- not to congest any more the present urban areas. Extend developmental activities to rural India. Remove all encroachment of water bodies/drains. Without this, whenever there are floods we cry like in the case of J & K or Uttarkhand of last year.